Caripill is a natural medicine that is made up of papaya leaf extracts. Carica papaya is the key ingredient in this vital tablet. This leaf extract is the key ingredient that helps in increasing the platelet counts in our body. 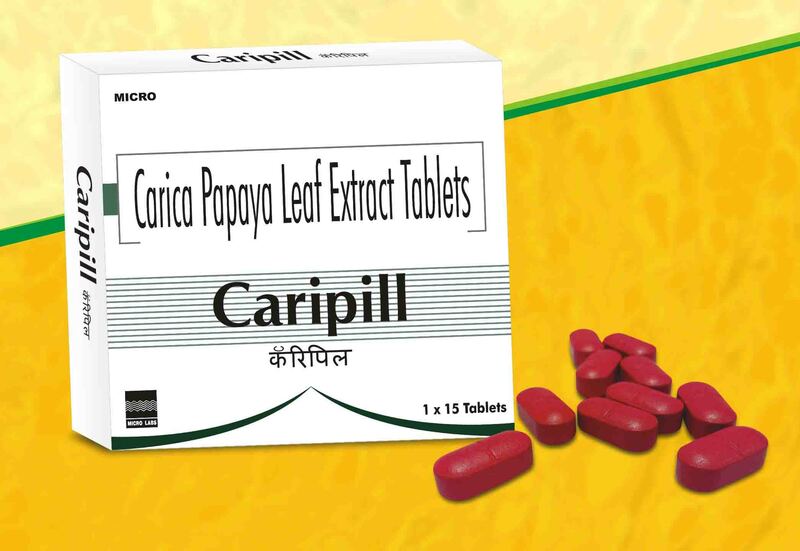 One Caripill tablet contains 1100 mg of Carica papaya leaf extract. However, 5 ml of syrup contains 275 mg of Carica papaya leaf extract. Caripill medicine plays an important role in dengue treatment. It is known for its medicinal properties to treat dengue patients by increasing their platelet count, which gets low during the disease. It is used by people across India and abroad for its ability to treat dengue effectively. Caripill is popular to treat serious medical conditions such as thrombocytopenia, dengue fever, wound healing, oxidative stress, and many more. Dengue fever usually settles down in 10 to 12 days. The treatment may need to be continued further in case of Dengue Hemorrhagic Fever or Dengue shock syndrome. Sometimes, an antipyretic drug is also given with Caripill to cure dengue symptoms and bring down the fever. It is imperative to understand the dosage and Caripill side effects to avoid any complications in future. The tablet should only be consumed only after it is prescribed by a medical practitioner. The dosage should also be strictly followed as per the doctor’s recommendation. Caripill tablet can be taken along with meals and post meals with a glass of water. It should not be taken on an empty stomach as it can cause a burning sensation in the stomach. The dosage varies for children and adults, which should be strictly followed. Usually, it is recommended to take it for 5 consecutive days. However, the dosage differs according to the doctor and sometimes dosage begins with merely with one tablet per day. Also, it is important to check your platelet counts while you are consuming Caripill tablets. Caripill tablet is used to control, treat and improve a number of health ailments, illnesses, medical symptoms and conditions. There are a number of uses of a Caripill tablet; however, it is important that you do not overlook the side-effects of having this medicine. These harmful effects are not common to all; they may vary from one patient to another. The reaction on the body is quite subjective and it also depends on the gender, immunity and age of the consumer. It is also based on the current health conditions and medical history of the consumer. Inflammation or swelling on lips, throat, mouth and more. In case you experience any of the aforesaid caripill side effects or any other sudden or abnormal and changes in the body, immediate medical help is recommended. You can consult or inform a qualified medical practitioner to avoid any adverse medical conditions. Also, it is not recommended to consume caripill for a longer duration, as it may increase the risk of side effects. Therefore, you should strictly follow the doctor’s prescription. Caripill is not recommended for patients facing any kind of bleeding disorders. It should not be consumed if you are taking any blood thinning medicines such as aspirin. The combination of oral hypoglycemic and Carica Papaya Leaf extract can significantly reduce the blood glucose levels. For this reason, it is required to carefully monitor the blood glucose levels to prevent hypoglycemia. If you planning to conceive a baby anytime soon, then Caripill should not be consumed without consulting a certified gynaecologist to avoid any harmful effects in future. Furthermore, it is not advisable for children above the age of 10 years without any medical supervision. Also, it is not recommended for kidney patients or people who are undergoing dialysis procedure, then the medicine should be consumed only if it recommended by a doctor. As this medicine can cause drastic effects on your health and body, it is advisable to always consult the specialist. The usage of caripill in treating dengue is well established. However, just like all the other medicines, it should also be taken only after it has been prescribed by the doctor and after you have ascertained its possible side-effects.